Located in the southeast corner of Stamford and known simply as “The Cove”, this community offers many amenities and recreational activities on the waterfront. 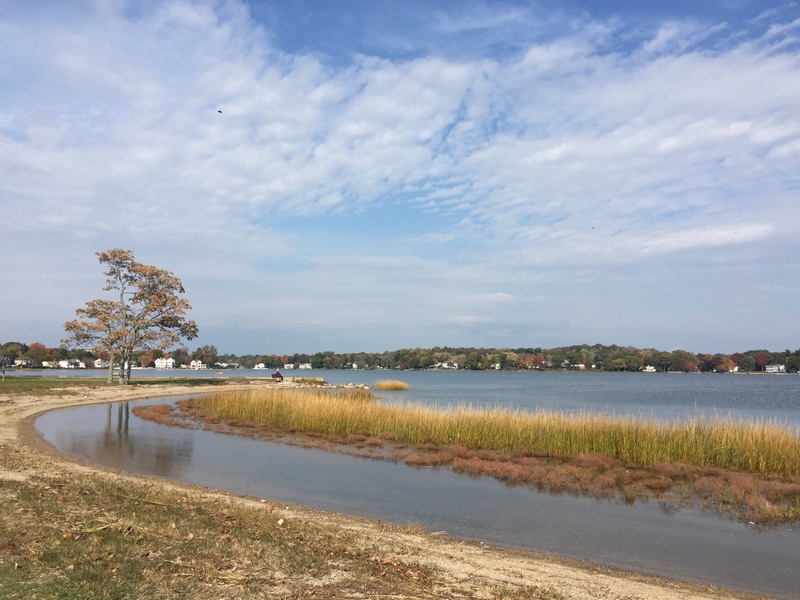 Cove Island Park, the jewel of the neighborhood, is an 83 acre park & beach offers 2 beaches, walking & biking paths, fishing, picnic & BBQ areas, sailing & kayaking and is home of the renowned SoundWaters environmental program. Condos, apartments, single family & multi-family homes abound in this lovely neighborhood. Masterful design and modern luxury are uniquely embodied in this Colonial built in 2006 with the finest craftsmanship and architectural details with no expense spared. The beautiful 2 story Foyer welcomes you to this magnificent property with spectacular views of Holly Pond, sun filled rooms, 9' ceilings and gleaming hardwood floors throughout. Entertain in the Chef's dream Kitchen that features an impressive six burner professional range with a griddle, a pot filler, top of the line refrigerator and granite counter tops. The Dining Room has views of the large, private Patio ideal for dining al fresco and features a stone wood fireplace/grill combination. Relax in the Living Room with a wood burning fireplace is ideal for both cozy family movie night and entertaining guests, a Home Office and a Half Bath complete this level. Relax and unwind on your Master Bedroom Suite with water views, a Jacuzzi tub, glass enclosed shower, double sink vanity and a huge walk-in closet. This level is completed with two additional oversized Bedrooms, a Jack & Jill Bath and the Laundry Room. The attic provides plenty of extra storage. Turn the key, sit down and relax in this beautifully maintained, professionally landscaped property with in ground sprinkler system. Walking distance to Cove Island Park Beach and Marina, just an 8 minutes' drive to the Stamford train station and a 45 minutes ride to NYC. Summer is coming for you to enjoy the private beach at the end of the street from this bright, spacious and updated home located in the convenient water community of The Cove! The foyer leads to a nicely size living room with lots of light and an adjacent dining room with french door out to the back patio for outdoor dining and entertaining. The terrific and updated kitchen offers a center island, granite counters and high end appliances including a Thermador gas range. The family room has a fireplace and sliders out to the back yard and there is an office, or possible 4th bedroom on this level as well, perfect for an au-pair. Upstairs is a nice master bedroom with chic updated bath and lots of closet space. Two additional bedrooms and another updated full bath completes the second floor. There is a play room/exercise space on the lower level. The property is beautifully landscaped and the back yard offers lots of space for outdoor games and a brand new central air conditioning system was just installed in time for summer! All this and just minutes to the amazing Chelsea Piers Sports complex, shopping, beaches, parks and under an hour to New York City! Direct Waterfront on Holly Pond! Completely Renovated 4 Bedroom 1.5 Bath Split Level sitting high atop a beautiful .21 acres. The entire home has an open feel, with sun filled rooms, stunning views, and hardwood floors. Kitchen with center island, opening up to a spacious dining area and living room with oversized window to capture the water views. The second floor consists of 4 bedrooms and 1 bath. Attached 1 car garage, and private back yard. Meticulously landscaped grounds with sprinkler system and backyard waterfall. Short walk to Cove Island Park & Chelsea Piers. Minutes from the Noroton Heights & Stamford R/R Stations. Not to be missed! Large Single Family home. This is a unique property in a very desirable Cove area. Unlimited potential in this commercial area . House totally fresh painted interior and exterior. Will qualify for any type of mortgage, property in good condition. You can be creative and turn it into a Multi-Family or totally Commercial or just enjoy the spacious environment. Has 8 parking spaces. Handicap ramp. First and Second Floor has A/C. Full basement-partially finish. This property sits in the middle of Restaurants, bus lines, House of worship, Supermarket, Financial Institutions. Close to I-95, train station, walking distance to Shippan Beach and 5 minutes drive to Cove Beach. Come and make this property your own. Back on Market- Buyer couldn't perform. Listed by Auslander Kasindorf Group of Keller Williams Prestige Prop. Walk to Cove Island & Cummings Park! Unique opportunity 2 family home on quiet dead end street. Home is meticulously maintained and well cared for. Separate Utilities. 1st Floor - 1 Bedroom 1.5 Bath. 2nd floor - 2 Bedroom with Open Concept - Cathedral Ceilings and Skylights. Well Manicured Front & Back Yard. Oversized 1 Car detached garage and Additional Off Street Parking.